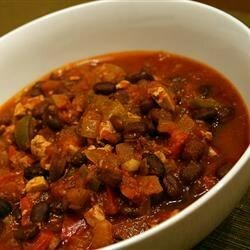 "This is one of the best, easiest, and tastiest vegetarian chili recipes I've ever tasted. Whenever I make it, my friends devour it. Best eaten with tortilla chips, Cheddar cheese, guacamole, and sour cream. What a treat! The recipe creator's name is Doc Meromorphic. He is a good friend of my family." Heat the olive oil in a large skillet over medium-high heat. Add the onions; cook and stir until they start to become soft. Add the green peppers, red peppers, garlic and tofu; cook and stir until vegetables are lightly browned and tender, the whole process should take about 10 minutes. Pour the black beans into the slow cooker and set to Low. Stir in the vegetables and tomatoes. Season with salt, pepper, cumin, chili powder, oregano, vinegar and hot pepper sauce. Stir gently and cover. Cook on LOW for 6 to 8 hours. This recipe was flavourful and so tasty. I liked the combination of the different spices. I nixed the tofu and added a can of chickpeas and corn - it added a very good texture to the chili. My family loved this recipe! I used YVES ground tofu instead of the package firm tofu and also added one hot jalapeno. WOW..EXCELLENT DISH!